Perfectly balanced, superbly neutral and highly musical. Fusion Audio is a brand that I had not heard of, until I was contacted by the Dutch distributor, asking me if I would give these cables a listen, adding that he wouldn’t have contacted me if he didn’t think these cables were something really special. And special they turned out to be indeed. Review samples kindly supplied by Fusion Nederland. Retail price Enchanter 1400 euro for 1,5 m.
Retail price Romance PC2 1100 euro for 1,5 m.
Fusion Audio Netherlands is run by Gaston du Clou. He’s a super-enthousiastic person who can talk for hours about audio in generic and his recent discovery Fusion Audio cables in particular. He told me that he has taken these cables to various well known names in the audio world, and that responses were unanimously superlative. Gaston is much better then me, in speaking in flowery terms, so I won’t try to reproduce precisely what he said. Instead, I’ll just proceed straight to the review. 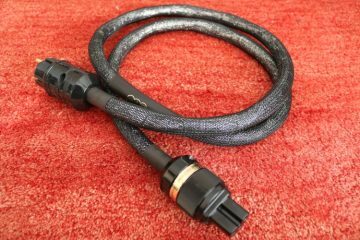 The review focuses mainly on the Enchanter powercord, but I’ve also included the more affordable Romance PC2 powercord near the end. 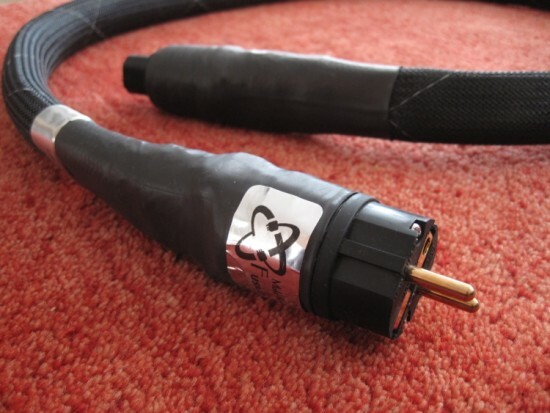 Very little is explained about the precise construction of Fusion Audio cables. What is specified is that the conductors are not litze or solid core but rather foil-based. The Enchanter uses a hybrid construction of copper and silver foil while the Romance PC2 uses only copper. The connectors are Cryogenically treated Gold Plated Furutech types. Precise type however is not discernable due to the shrink wrap used. In spite of looking very hefty, the Enchanter is not very heavy at all and also quite supple: it can be bent into position easily. All you need to be aware of is that the distance required from the component’s rear side to the back wall is about 22 cm (8.6 inch) due to the large amount of shrinkwrap. For a change I have not 1 but a whopping 5 Enchanter cables and 1 Romance PC2 available to play with, so I’ll start the review swapping one of my own Harmonic Technology Pro ACII cables for the Enchanter, then adding another, and another, reporting on the differences with each step. 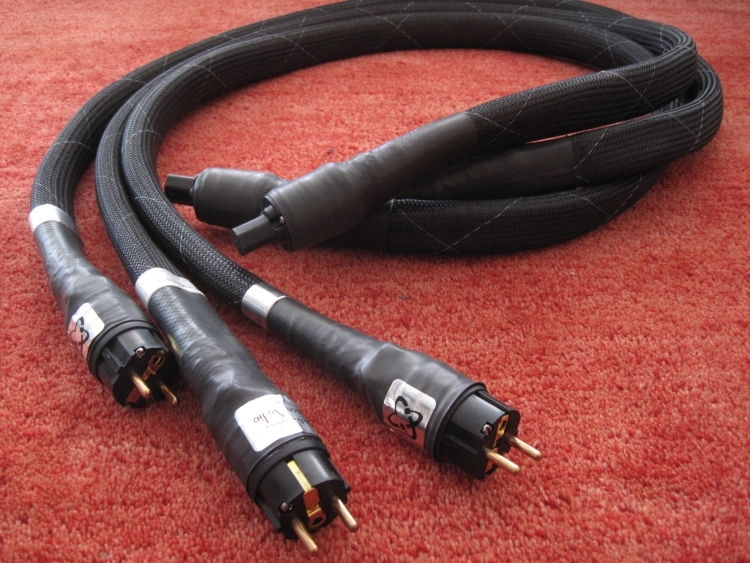 All 5 Fusion Audio cables came from a system that was used daily, so they were already played in. After having selected a few tracks with very different sonics on the AudioAanZee music server, I played them all for about the first half, then swapped the Harmonic Technology Pro ACII cable that feeds the Rowland Aeris DAC for the Enchanter and played all tracks again, this time in reverse order (last one played, played first and so on). What’s most noticeable is that the Enchanter has much better detailing, tighter bass and an overall more believable, more acoustically convincing timbre. Voices have more presence and rimshots are more explosive. So far this isn’t very special because lots of cables I tried sound more dynamic, faster, more detailed etc than my Pro ACII’s. The difference here is that unlike with all other cables I tried so far, the Enchanter doesn’t become even the slightest bit more analytical or technical in the process. But the plus sides of the Enchanter keep coming: soundstage is higher, wider and deeper, and the whole impression is of a much more lively presentation. The music is much more differentiated dynamically, but never in an in-your-face manner. The Enchanter can be just as gentle as the Pro ACII, but is a lot more neutral, and yet it doesn’t sound lean or devoid of colour. In fact, its bass is almost as weighty and deep as that of the Pro ACII, but a lot more articulate and with a more realistic “wooden” timbre. By this I mean that for example low piano notes sound more like the percussive wooden instrument that they are produced with than when using the Pro ACII. Midrange is another interesting aspect. While I know that the Pro ACII is somewhat recessed and even slightly compressed dynamically, I am ok with that because the cable sound so rich and smooth otherwise, and because it’s very forgiving of lesser recordings. With the Enchanter, the midrange sounds much more real, more expressive, more intimate, but without becoming even the slightest bit less romantic. The Enchanter seems to have a greater palette of expressions to choose from, and it seems to more accurately follow what’s in the recording. In spite of its precision however, the Enchanter is always gentle, will never shout and will certainly not punish you for playing less than ideal recordings. Treble is also more precise than with the Pro ACII, the latter being slightly smeared but very airy, and I am admittedly a fan of this kind of treble reproduction. I think it ties in with my Apogee Diva’s ribbon tweeter’s response. The Enchanter’s treble, like the rest of its frequency spectrum, is more articulate, yet once again, still very refined and fluid. It’s not quite as whispery-airy as the Pro ACII’s treble, but I can’t rule out that that is in fact an artifact of that cable. It’s more likely that the Enchanter is just more accurately reproducing what’s on the disc. Don’t mistake this for meaning that the Enchanter’s treble is dull, because that is definitely not the case. The cable sounds wide open. Its higher precision merely means that CD’s with treble that’s on the dry side, will also sound like that. But fortunately no matter what I play, the treble is never ever harsh or forward. The only thing one could argue is that the Enchanter doesn’t rose-tint the music as much as for example the Harmonic Technology Pro ACII does. But is that a vice? I think not. It can be a conscious decision to use cables to add colour, and I’m also guilty of doing so, but the Enchanter makes music sound much more like the real thing, without overlaying any kind of character and staying smooth and musical in the process. It does its work very anonymously too. I left the cable in the system for a few days, playing music every day, and I didn’t think about the cable anymore, until I took it out and replaced my Harmonic Technology Pro ACII. Ouch! That was a let-down. Pace was lower, the imaging fell apart and everything sounded way blurrier than I remembered it. After a while I got used to my old sound again, but it was pretty clear to me now just how good the Enchanter really is. If I had to choose 1 word to describe the Enchanter, it would be “coherent”. From top to bottom, this cable sounds utterly time-coherent, superbly neutral, uncoloured and it is just as highly resolved in the bass as it is in the treble, and everything in between. There are just no downsides to this cable, and that is very, very rare. 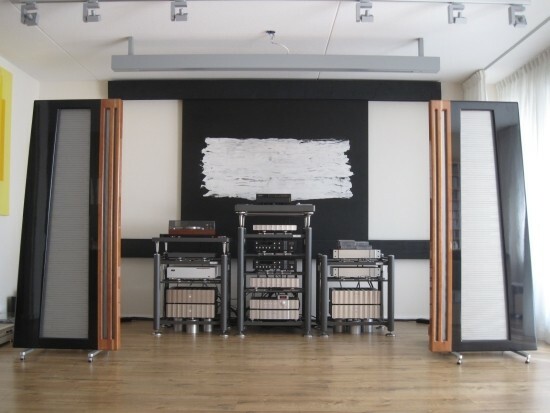 Until now, with powercables, higher precision has always come at the expense of musicality, romance, colour or fluidity. Not so with the Enchanter. How does it manage this? I have no idea. The above experience so far was carried out using only one Enchanter on the Rowland Aeris DAC. I wondered what would happen if I replaced more cables with Fusion Audio Enchanters. So out went the Belden cable that feeds my AudioAanZee Ultra Flow music server and in came another Enchanter. Upon the first notes of Patricia Barber’s “Too rich for my blood” on Cafe Blue my response was: Holy Cuacamole! Now I know that the Belden is a simple cable, but it is outfitted with IeGO gold connectors, and we’re talking about a music server, serving USB to the Aeris DAC after all. Of course I already knew that powercords do matter for the UltraFlow, but the magnitude of this difference really was absurd. The whole presentation seemed much more visceral, more powerful, more dynamic and alive, and still it was sublimely subtle and decidedly un-agressive. Oh and the soundstage was transformed: much wider, a little deeper, and with more obvious focus and imaging. Everything I wrote above about substituting the first cable with an Enchanter seemed to have doubled by also using an Enchanter for the music server. Going back to the Belden again felt like torture. Well, maybe not torture, but now all of a sudden I find the sound boring without the second Enchanter. And remember: this was the sound resulting from the first Enchanter swap. The very sound that I found so riveting before pulling out a second Enchanter… Isn’t it ridiculous how the psychology behind this works? I’m sure that I could get used to the old sound again, but do I want to after having heard this? Just to be sure I connected an Harmonic Technology cable to the music server, and although it improved on smoothness, fulness and fluidity over the Belden, it was a far cry from the spectacular involvement it produced with the Enchanter. I have a feeling that the server benefits even more from the Enchanter than the Aeris DAC. Perhaps this is because the Enchanter does a better job at filtering the noise of the music server’s switching power supply, but perhaps the server just benefits from better/more even conductivity or whatever it is that the foil conductors achieve, just like the Aeris does. Either way, the tangible result is that I am now fearful of having to purchase at least one Enchanter. While leaving the Enchanters for the Aeris and UltraFlow in place, I substituted the Harmonic Technology Pro ACII on the Rowland Coherence II preamp for an Enchanter as well. Law of diminishing returns? Or my preamp is less sensitive to power cables. The latter is certainly a factor, the Coherence being battery-powered, but in spite of that, you still can hear power cables’ influences. But in any event I felt that this third Enchanter once again expanded the soundstage, but this time the improvements weren’t as earth shattering. And although the Enchanter’s part silver conductors do not sound “silvery” in a grainy, harsh or edgy fashion, I do feel that when using 3 of these cables, the “silver” characters starts to shine through, present not as harshness but more like there’s just a little too much presence in the upper mid range. Substituting the Enchanter on the preamp for the Romance PC2 made for a better balance: slightly darker and less articulate throughout, but also warmer in the upper bass and midrange. Oftentimes too much of a good thing is still too much. 3 Enchanters for me is perhaps overkill. 2 Enchanters and a Romance PC2 however seem to be the perfect seasoning for my setup. The magic in the end comes from carefully balancing components, cables and tweaks. This goes for all cables: I also can’t just wire my entire set with Belden, or with Harmonic Technology. In my experience, it’s the mix that makes the magic. After my positive experiences, I looked out to hearing the cable perform at my friend JW’s place. 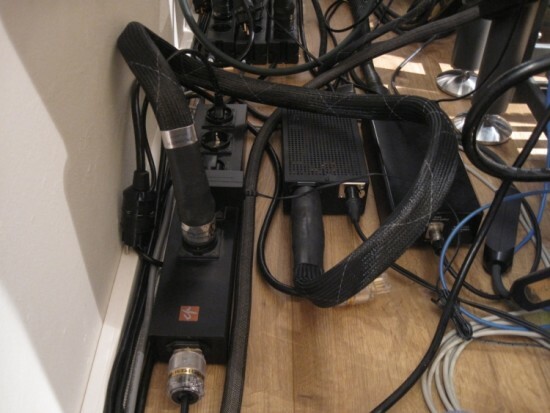 JW is famous in my book for being unable to find the perfect power cable for his Wadia 861. He has been hooked on a 110CY 5G2,5 Lapp cable since forever it seems, in spite of trying every cable that visited my setup. Some seemed promising but none have stuck around as long as the Lapp. 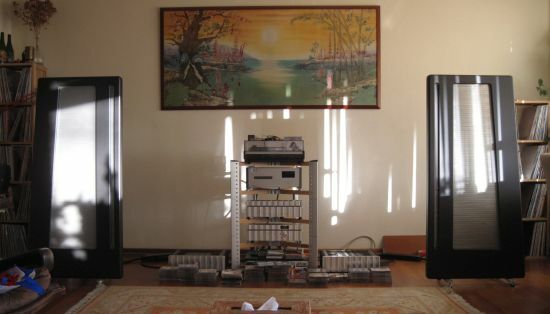 In a recent effort to improve on the Lapp situation, JW used a Cardas Clear Beyond powercable on the Rowland Synergy IIi Preamp and an Oyaide Tunami on the Wadia 861. I had not actually heard his sound since the Lapp period so I was in for a surprise. When he played his system for me, I couldn’t help but to tell him that it just didn’t move me. Bass was fantastic, and timbre was very good too. But there was no joy in the sound, no sunshine, and it just did not move the soul. Fortunately he felt the same, which was the reason for his powercable search. After swapping the Tunami for the Enchanter it took less than 5 seconds to realise that the improvement was absolutely astonishing. Even more so than at my place, JW’s soundstage now extended way beyond the loudspeakers’ enclosures. It was as if his Duettas had grown in size, coming closer to the authoritative sound of my Divas. What’s most important though is that the Enchanter clearly illustrated that the Tunami only threw the sound forward in a solid ball of power, whereas the Enchanter spread out the sound across the room in all dimensions, with superb soundstage layering and an entirely convincing ebb and flow between relaxed calmness and dynamic outbursts. There was now real joy and involvement to the music. Apart from portraying all the qualities I described in the first part of this review, it was again baffling how the Enchanter could perform so well in a place where previously the extremely in-your-face Tunami seemingly also fit in. The Enchanter is like a chameleon it seems, fitting in without having any obvious character. Not any? Well, in JW’s brighter sounding system (actually my Divas are a bit dark), the difference between the Enchanter and the Romance PC2 was even more interesting. To make for a nice blind listening test, I did not tell JW what constituted the differences between the two cables, I just let him hear both. He easily passed the test though, indicating quite correctly that the Enchanter, while speactacular, could with some CD’s sound somewhat spotlit in the upper midrange, while the Romance PC2, being warmer, was more to his liking. The latter could sound more restrained, or rather less initially spectacular than the former, but the Romance PC2 can really surprise with sudden bursts of energy, and can sound even more dynamic because of that. The Romance PC2 is much like the Jeff Rowland sound: never shouty but spectacularly refined and in fact very dynamic but without being blantant about it, and this seems to fit in JW’s system better than mine. After many tests trying the Romance PC2 and Enchanter on his Rowland Synergy IIi and Wadia 861, alternatingly swapping with the Cardas Clear Boyond and Oyaide Tunami, we came to the conclusion that the Clear Beyond was in fact pretty good, but the Tunami, while having admittedly more solid bass, was otherwise not a good match at all. Clear Beyond and Enchanter were a very good combination, especially in terms of solidity and timbre, but ultimately JW and I both preferred the combination of Romance PC2 and Enchanter, for their more lyrical and and most vivacious presentation, allowing us to be entirely mesmerised by the sheer beauty of the music. The Fusion Audio Enchanter is quite simply the most impressive powercable I’ve heard so far, winning me over with a combination of technical excellence on the one hand and pure and delicate and unforced musical expression on the other. The Enchanter excells on every technical aspect, being neutral, transparent, lively and dynamic, and yet there’s an incredible ease to its presentation and not a hint of edge or shoutyness. Its low level detailing has to be experienced. It’s not like all the sounds are just lifted equally like what happens if music is compressed, rather the music is presented as a very quiet landscape out of which the tiniest sounds emerge with precision and delicacy in equal measure, after which they do not drop off into a black hole, but linger on, decaying seemingly forever. That last quality reminds me of how analog, when done right, can be both dynamic and relaxed at the same time. The Enchanter also has no electronic signature whatsoever, its timbre being highly natural. It boasts room-filling soundstaging, but with very holographic imaging and precise focus. I don’t know how they pulled it off, but there are just no downsides to this cable, and that is very, very rare. While the Enchanter uses a hybrid copper-silver construction, the Romance PC2 uses copper exclusively and true to typical perception, it also sounds more rounded, more relaxed and warmer from midbass through midrange. The Romance PC2 does however still deliver the same qualities as the Enchanter: it’s still capable of portraying superb micro detailing, still extremely coherent, and still very spontaneous, just taken less to the extremes, and while I found that my setup did not need a Romance PC2 until I added 2 Enchanters, people with a brighter sounding setup may be better off using both in equal numbers, or only the Romance PC2.